Young Eagles – Free Flights for Kids! The EAA Chapter 240 Young Eagles program is a unique way of welcoming young people to the wonder, exhilaration and freedom of flight. The program is sponsored by the EAA Aviation Foundation, a non-profit organization, dedicated to providing a motivational aviation experience for the younger generation. The initial goal of the Young Eagles Program was achieved by flying one million children by the year 2003 – the 100th anniversary of the Wright Brother’s flight at Kitty Hawk and the dawn of aviation’s second century. EAA Chapter 240 played its part in flying many local children. The program has been so successful that it has been extended indefinitely. 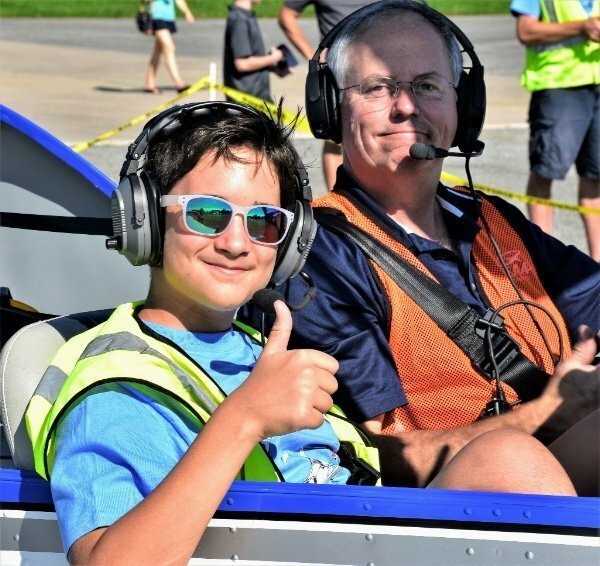 EAA Chapter 240 continues to participate in this exciting program, offering your child the safe and truly unforgettable experience of flying above the Tri-State area and each year we fly 100+ kids – for free. Join us! The Young Eagles program is for youngsters ages 8 – 17 years. Groups of kids should register with us in advance please, by emailing us: YoungEagles@eaa240.org. Individuals may join us on the day too, on a first-come-first-served basis. Questions? email us! PLEASE NOTE: there is a registration/waiver form that must be signed by a PARENT OR LEGAL GUARDIAN. This can be done at the event. If parent/legal guardian is not attending, please contact us at YoungEagles@eaa240.org and we will be happy to mail forms in advance. Please note that we cannot accept photocopies of this form, and kids cannot fly without the form being completed. Young Eagle Events take place on the same dates as our Famous Pancake Breakfasts, so join us for breakfast too! Bring the family! Bring your camera! Young Eagle Flights commence at 9am, and the program closes at noon. Weather plays a key role in smooth and safe flight experiences for the kids, and pilots so please monitor our web site and Facebook and Twitter (EAA240) for announcements or email us at YoungEagles@eaa240.org. Before flying, the Young Eagles are given a presentation of the airplane, it’s flight controls. how it flies and instructions for the 15 to 20 minute flight. Each flight takes place in a registered airplane flown by a licensed, experienced EAA General Aviation pilot, who volunteer their time, their aircraft and their expertise to provide the opportunity of safe flight experience to kids. Only standard maneuvers are performed during the flight and the one-time flights are provided free of charge. After the flight, flight certificates and flight log books are provided to the Young Eagle, as well as guidance on where to get more information to continue the experience of flying. For more information about the national program visit the EAA National Young Eagles web site for all the details about this exciting national program.